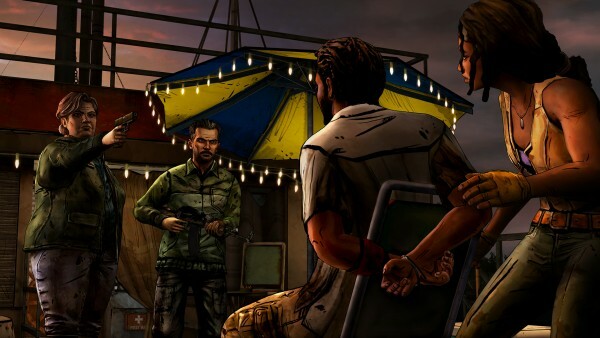 Telltale Games had quite the task ahead of them when they announced that they were making a mini-series following one of the most popular characters from The Walking Dead and after the first episode was released last month, things weren’t looking the best. 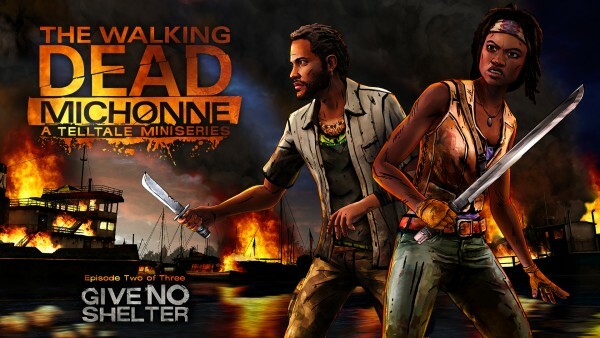 After a very short experience fans were left waiting for more and now that the second episode, The Walking Dead: Michonne – Give No Shelter, has been released where does the story go now? As usual with a review for an episodic title, those who have yet to play the first episode in the series should do so before continuing on as there may be events spoiled in the following review. Similar to the first episode, those who aren’t caught up with the comics don’t need to worry about any spoilers regarding that aspect as this continues to remain a self-contained storyline. Now that that is out of the way, The Walking Dead: Michonne – Give No Shelter starts up immediately where things left off, with Michonne, her recent traveling companion Pete, and Sam still under the guard of the makeshift rule of Norma and Randall. This doesn’t last long however as the group quickly makes a fiery escape leaving plenty of extremely angry people prepared to pursue them. This results in the trio having to head for Sam’s home that just so happens to be within walking distance and, considering the fact that the biggest aspect about Michonne’s character so far has been the fact that she is haunted by the memories of her two daughters, of course includes a couple of adults and two young children. These characters are given just enough time to introduce themselves and provide a little bit of backstory before everything goes south once more and the episode comes to a conclusion. 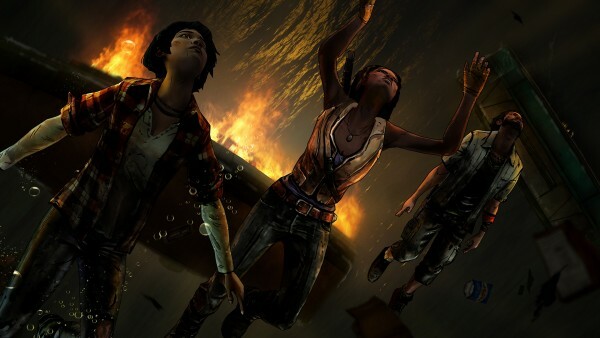 Similar to the first episode in the series, The Walking Dead: Michonne – Give No Shelter is an incredibly short experience even by Telltale standards as it clocks in at roughly fifty minutes in length at best and, considering there is only one real decision that appears to make a difference and that different won’t play any role until the next episode, players will find little reason at all to go through the episode a second time. Thanks to this short length players cannot expect much in the way of development for any of the characters they come across, though Sam does get some much needed development and Pete continues to show just how capable he is in his own way and show off his beliefs, which are often a direct counterpoint to what Michonne is used to doing. 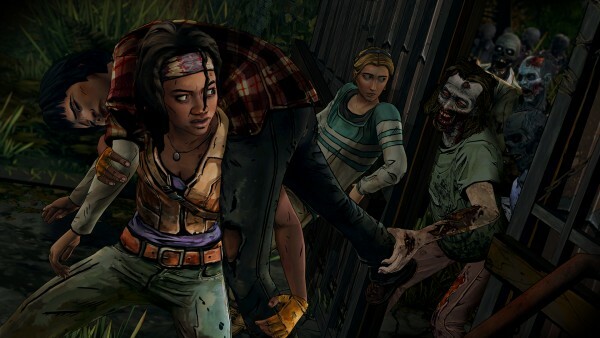 As far as Michonne herself is concerned, players will continue to learn a bit about her past as one major flashback sequence places players in an area where they are trying to search for clues about what happened to her little girls. I do have to give the writing team a decent amount of credit for this episode however as the pace never really feels like it slows down at all as there are plenty of tense moments scattered throughout the episode and since Michonne and the group are always reacting this episode and rarely acting on their own, the episode never feels dull and although you can see it coming a mile away thanks to the way it is set up, there is still a certain surprise event that will leave players shocked. 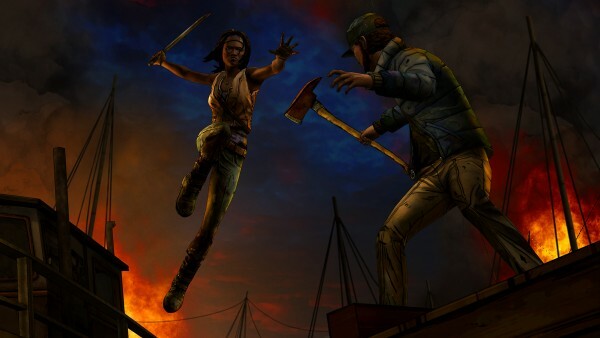 Similar to the previous episode, The Walking Dead: Michonne – Give No Shelter provides your standard gameplay mechanics in the form of making different dialogue choices, exploring a little bit, and taking part in quick time event based combat sequences. There are very few areas to actually examine this time around, with the only real moment taking part via the aforementioned flashback but in its place comes a ton of combat sequences and running scenes. This means that there are plenty of suspenseful moments including a scene where Michonne puts together a signature pair of tools to escape and the same style of heavy action that was presented in the first episode. This means that Michonne continues to exemplify just how capable she is with her weapon regardless of whether or not her opponent is alive or undead. The comic art style continues to work to the benefit of the series throughout this episode and I must give the animation team a good amount of credit in portraying the various emotions that Michonne is feeling through her facial animations since she is often a character of few words. Once more the various elements of violence and gore on display here are a step above the previous series since Michonne is far more violent than any past characters in The Walking Dead series though the actual Walker kills this time around are fairly standard for the series. Once more a very nicely chosen voiced song is implemented into The Walking Dead: Michonne – Give No Shelter and Samira Wily continues to impress in her presentation as Michonne. It is worth noting that throughout my time in the episode however the game suffered from numerous moments of slowdown to the point that the game actually had to be restarted due to freezing during an incredibly basic scene during the flashback. 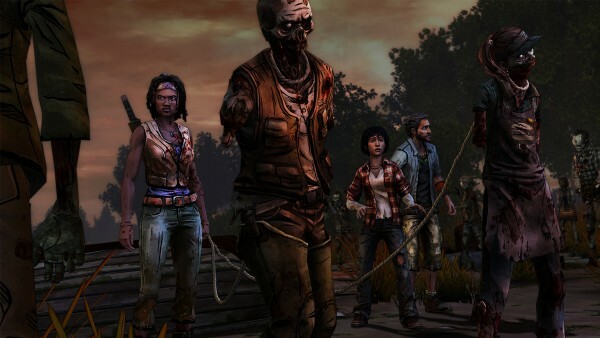 The Walking Dead: Michonne – Give No Shelter feels as if it would have worked as a middle episode in a much larger series however with the mini-series coming to a conclusion next episode, players are left with very little reason to care about any of the characters they have come across outside of Michonne and Pete. There is a clear conflict on the horizon that Michonne and the surviving members of the group she is with cannot avoid, but whether or not it will all be worth it in the end is certainly still left to be seen.